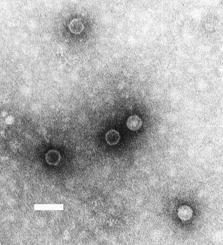 Description: Note that poliovirus particles exhibit a basically featureless appearance in comparison to other small viruses such as astrovirus, Norwalk virus and other SRSVs, and typical (non-SRSV) calicivirus. Bar = 50 nanometers. Method: Negative-stain Transmission Electron Microscopy on cell culture.